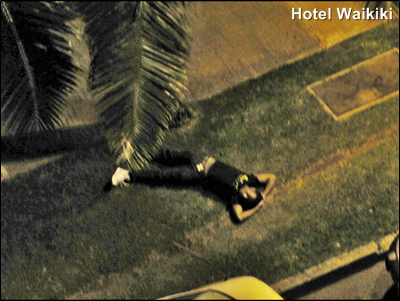 I happened to look down from my lanai (balcony) at 4am in the morning, and I see this person snoozing on the Ala Wai. Weather's great, undoubtedly. In all probability, Mr. Anonymous was bar hopping earlier in Waikiki and consumed too many alcohol beverages. For one, he bedded down right under a street lamp instead of the darker sections between two adjacent street lamps. Felt too lazy to get up and turn off the light switch. By the time he wakes up, Justin Beaver will have re-married already. Btw, it was a balmy 72° at 4am (weather bureau) and actually felt warmer. No chance of snow tonight. Could he be a homeless guy? It's a good thing he doesn't live in Pearl City or the mosquitoes would be sucking his blood and giving him Dengue Fever. Sheesh! Kay- he's too well dressed to be a homeless, and anyways a homeless would have staked out a bench. Eventually, the sprinkles came on and finally woke him up, LOL.